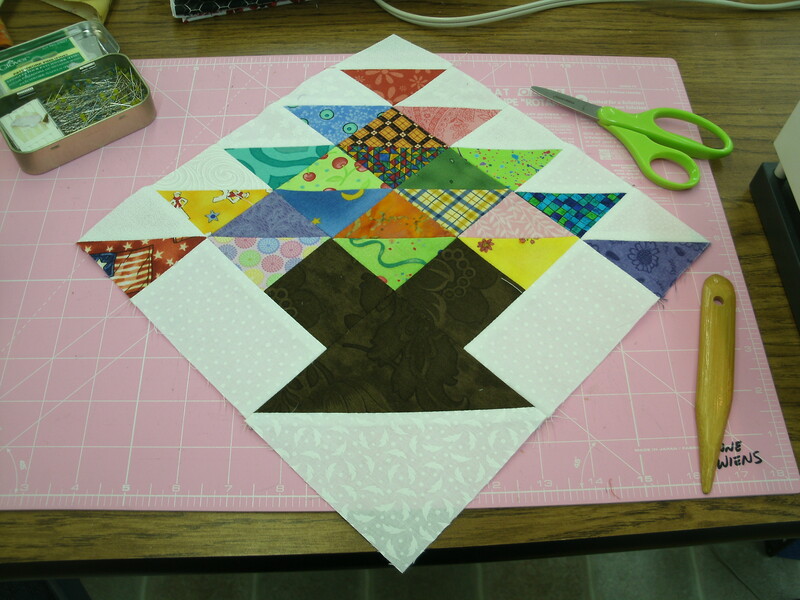 In The Thrifty Quilter, I show one way to make half-square triangles (HST’s). I’m often asked if these units have to be made using this method when making the blocks in the book. No, they don’t. I went with that particular method because it was easy to use for any size HST needed in the book. To be honest, it isn’t even my favored method. 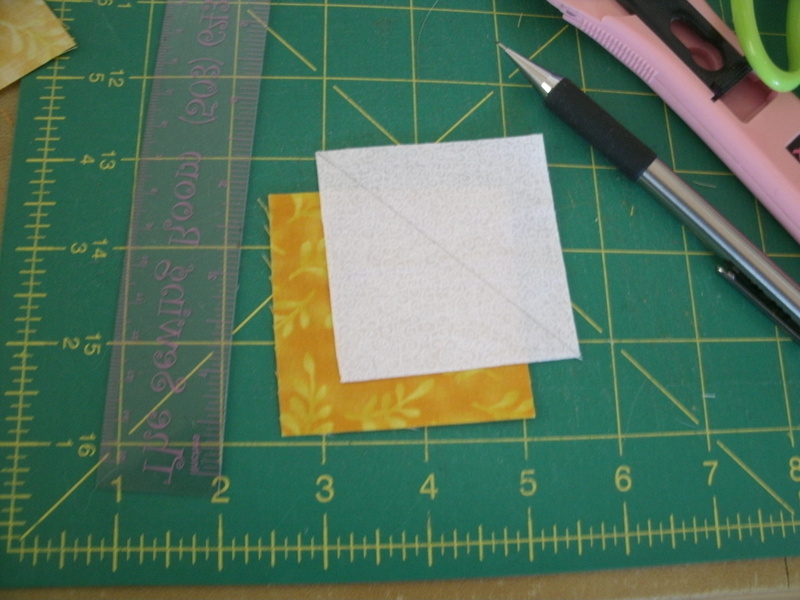 Step one: Take two 2.5″ squares and place them right-sides together. Draw a diagonal line on the back side of the lighter square. 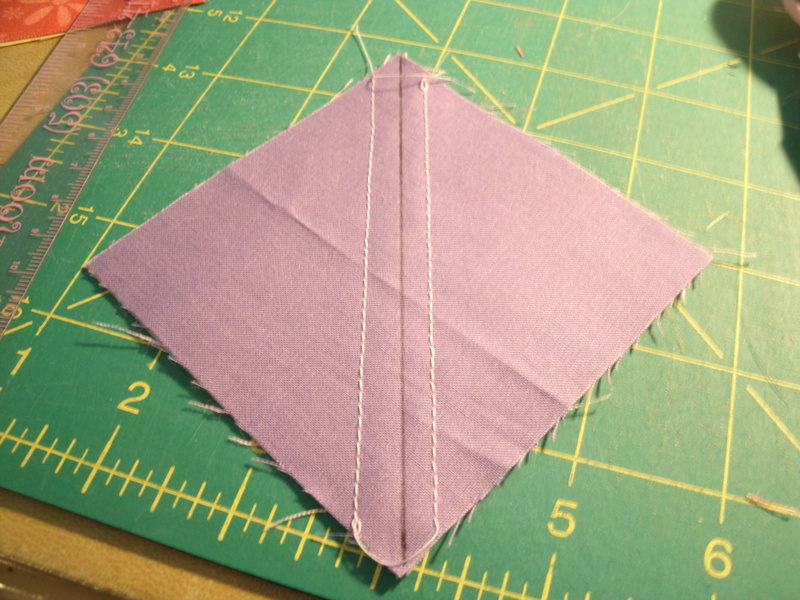 Step two: Sew ON the line and trim 1/4″ away from the seam. Step three: Open the HST unit and press. I almost always press my seams open, but you can press to the darker triangle if you prefer. That’s it…three easy steps. Of course, there is a down-side to this method, in that you use two squares to make one HST, and you wind up throwing away a pretty good-sized piece of each square. 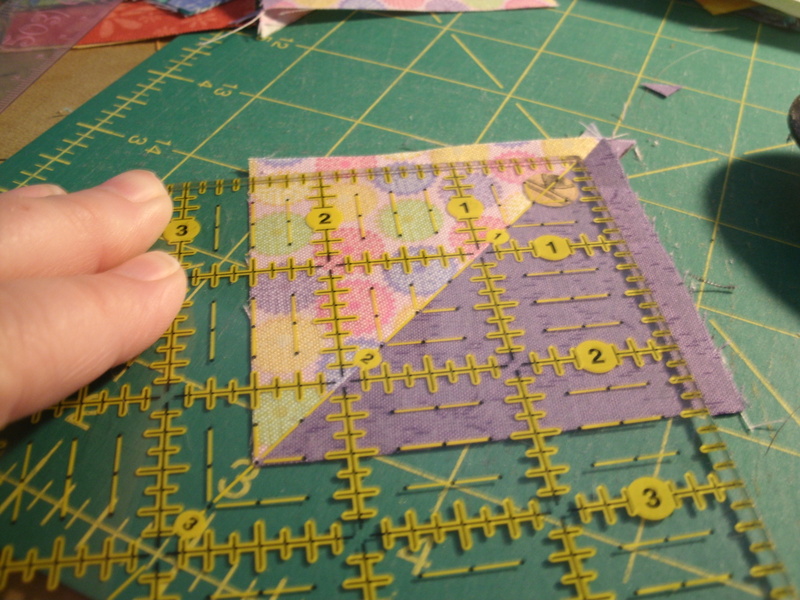 Few of us would cry over the tiny “waste” triangles from a 2.5″ HST, and I have discovered that if you save the waste triangles from 3.5″ squares, you can actually still make a 2.5″ HST from them. The leftovers from a 4.5″ HST would give you enough to make a 3.5″ HST. Now, here is the method I use most often. Take the finished size of HST you need and add 1″. 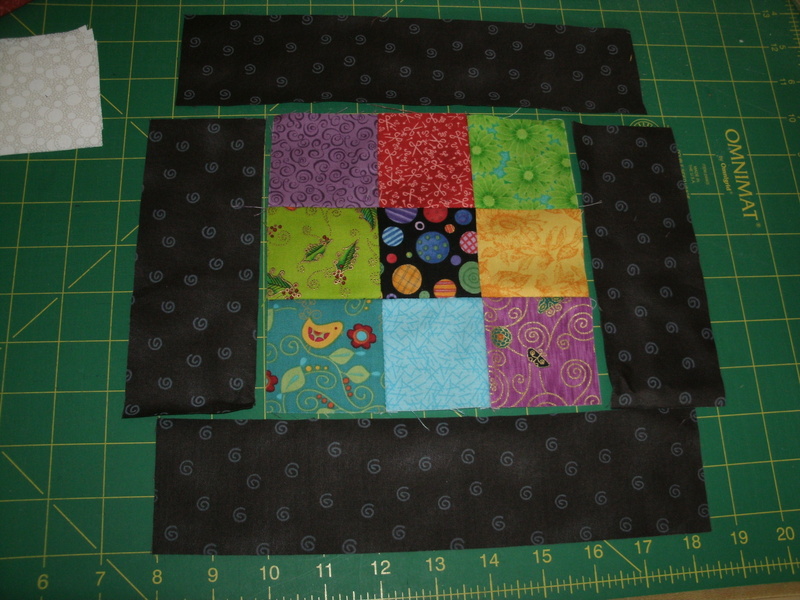 Since the HST’s I’m using in this block are 2″ finished, I need 3″ squares to start. 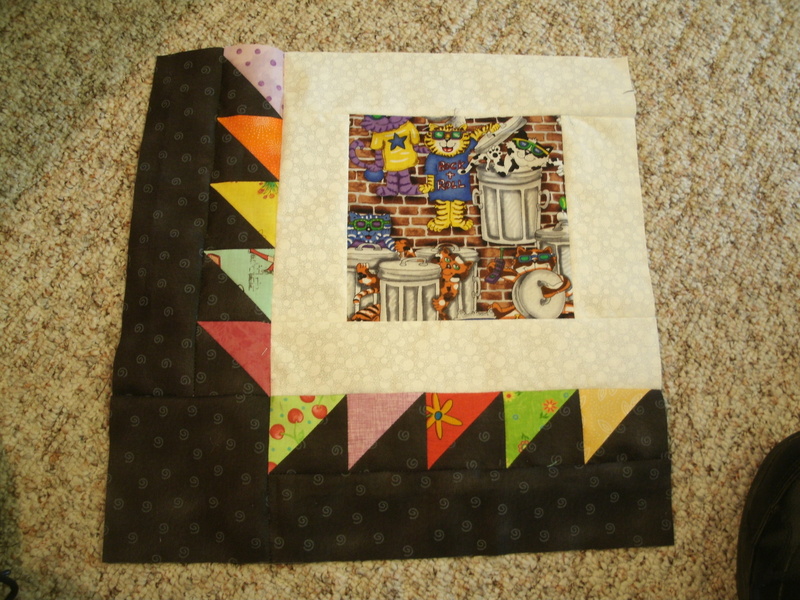 Of course, I have a Thrifty Quilter bin full of 3.5″ squares, so I’ll just use those. Step one: Place a dark and light square right-sides-together, draw a diagonal line on the back of the lighter square and sew 1/4″ on each side of the line. Cut the triangles apart on the drawn line. Step two: Press open. You need a ruler with a 45degree diagonal line that goes into the corner. 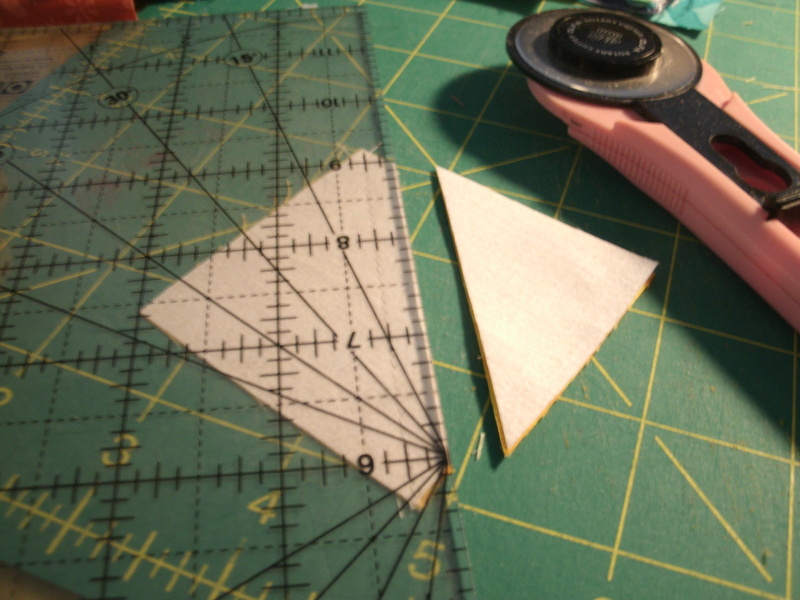 Lay this diagonal line on the seam, making sure the portion of your square under the ruler is larger than 2.5″ (or the desired size of the HST you’re making). Trim the right and top sides. 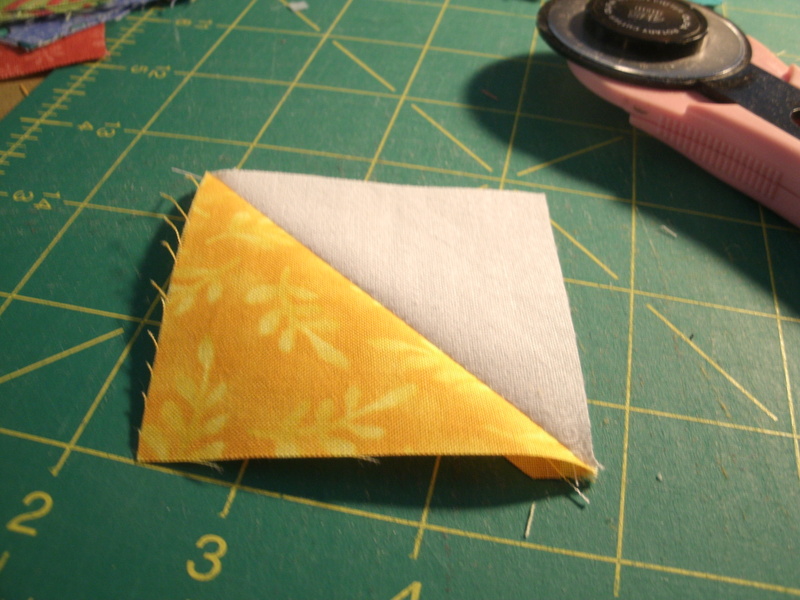 Step three: Flip the HST around and lay the ruler down again with the diagonal line on the seam. This time, the sides you just cut should line up with the 2.5″ vertical and horizontal lines on the ruler. Again, trim the right and top sides. There are a couple of advantages to using this method. First, you get two HST’s from two squares with less waste. Second, the HST’s are exactly the size you need. The bonus: no dog ears to trim! So, let’s fill a scrap basket with HST’s, shall we? The pieces for the Overflowing Scrap Basket laid out. 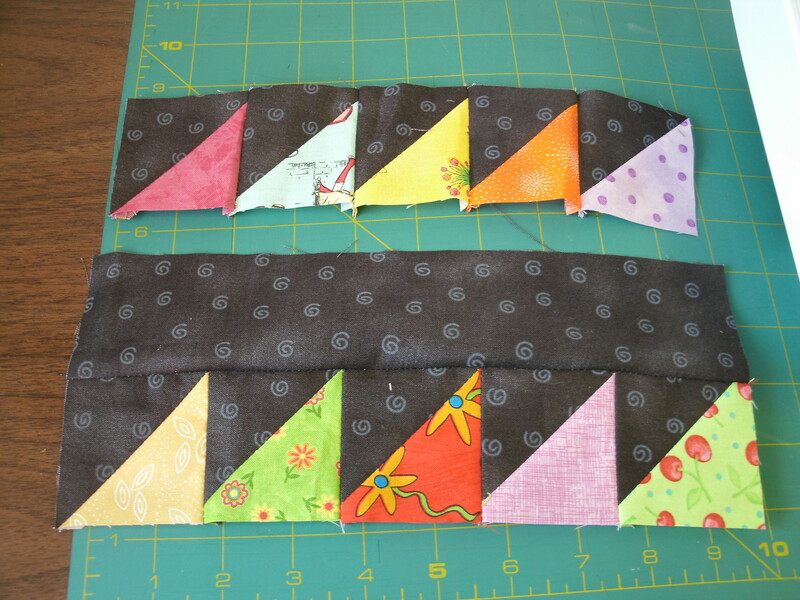 Sew the pieces into units as shown above. You can see this leaves you with four square units that are sewn together first. The sew the strips of white/print HSTs to the right side and top to complete your Overflowing Scrap Basket block. Make two of these blocks, and over the Labor Day weekend, I’ll give you a tablerunner pattern to make with them! The idea behind the Thrifty Quilter system is to use up scraps and leftover fabrics, so I have one rule that I have made for myself. I don’t impose it on anyone else, but feel free to adopt it. When I’m making a “TQ” quilt, I only allow myself to purchase one fabric specifically for that quilt. Usually it’s a background or border piece. It helps me avoid the temptation to buy a little bit of the “right” shade or print, which tends to lead to several purchases, and pretty soon, you’re making a scrappy quilt, but not a scrap quilt. I am pretty pleased with myself, because this quilt “Fireworks” is a true scrap quilt. All of the fabrics used were leftover from other projects. First, you will need four of the “Spinner” blocks from the In A Spin post. Next, you need to make five alternate blocks. 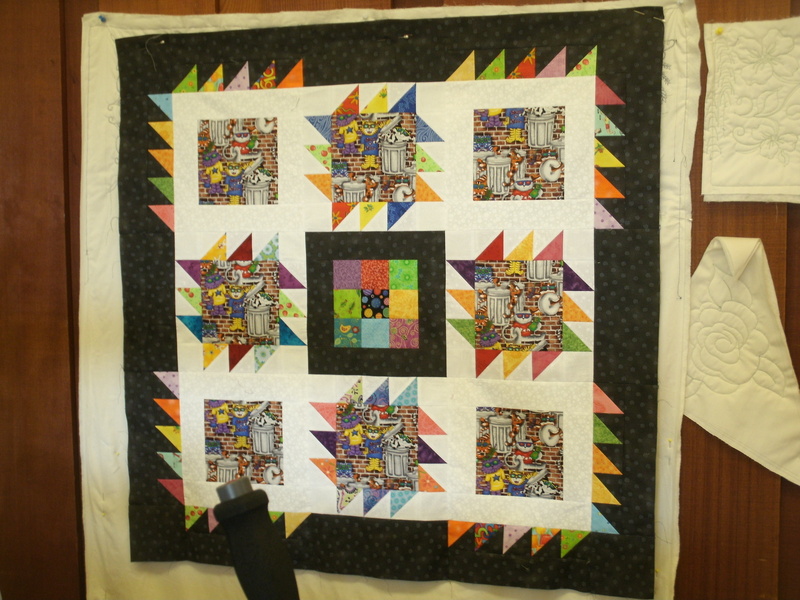 I had intended to use Laurel Burch cat prints, but it appears I used them all in another quilt. However, I did have eight 6.5″ squares of this alleycats print. 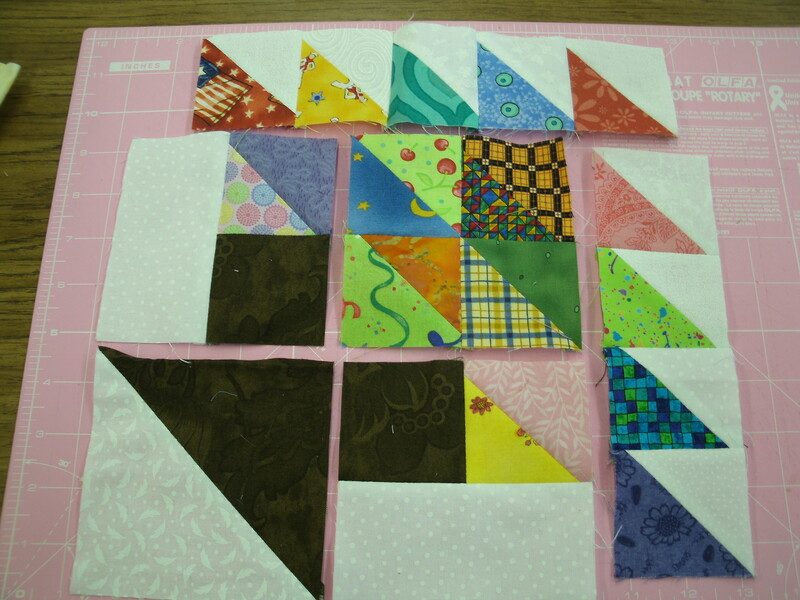 I used four of them to make Spinner blocks, and I added a 2″ (finished border around each of the four remaining squares. The white border strips are (2) 2.5″ x 6.5″ and (2) 2.5″ x 10.5″. For this quilt, I chose to make a 9-patch with 2.5″ squares and bordered it in the dark gray I planned to use in the outer border of the quilt. 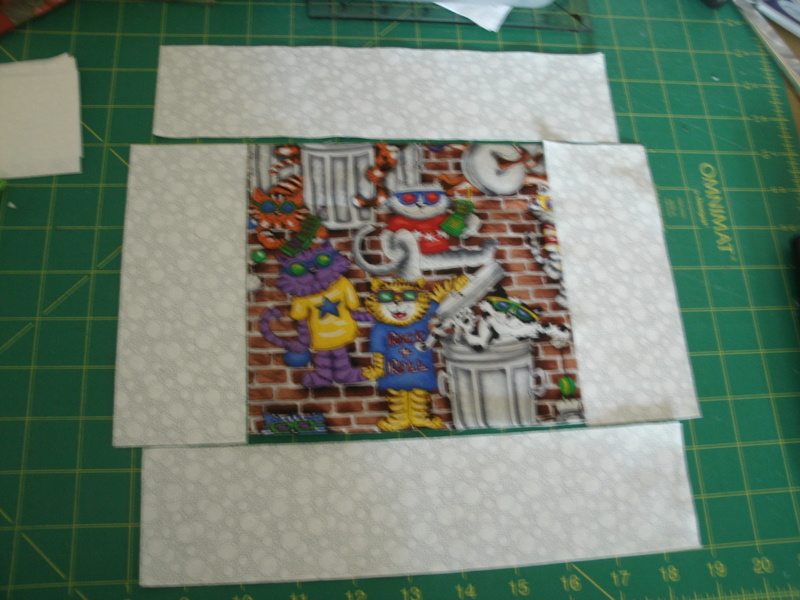 Again, the border pieces are cut (2) 2.5″ x 6.5″ and (2) 2.5″ x 10.5″. For the border, you will need to make a total of forty 2.5″ half-square triangles (HSTs.) Each HST has a scrap triangle and a dark gray triangle. You will also need to cut four 4.5″ dark gray squares, four 4.5″ x 10.5″ dark gray strips and eight 2.5″ x 10.5″ dark gray strips. Make eight border segments. Each one has five HST’s (be sure the all “point” the same way). Sew a 2.5″ x 10.5″ strip to the top of each HST strip. 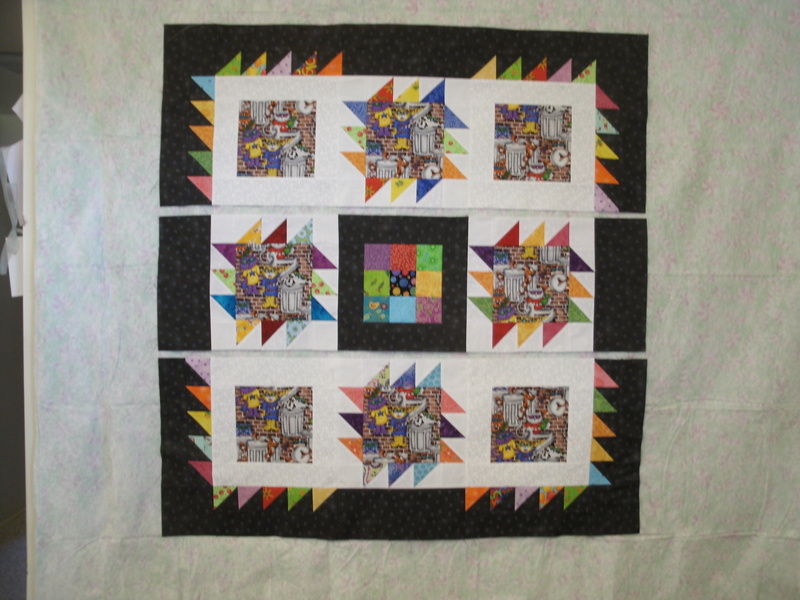 Fireworks quilt – lower left corner unit. Now you need to make four corner units. Each one uses two of the border units you just made, a 4.5″ dark gray square and one of the alternate blocks. If your 6.5″ featured squares are a directional print, you will have to be careful that you alter which sides you sew the border units to, so that you keep the center print right-side up! 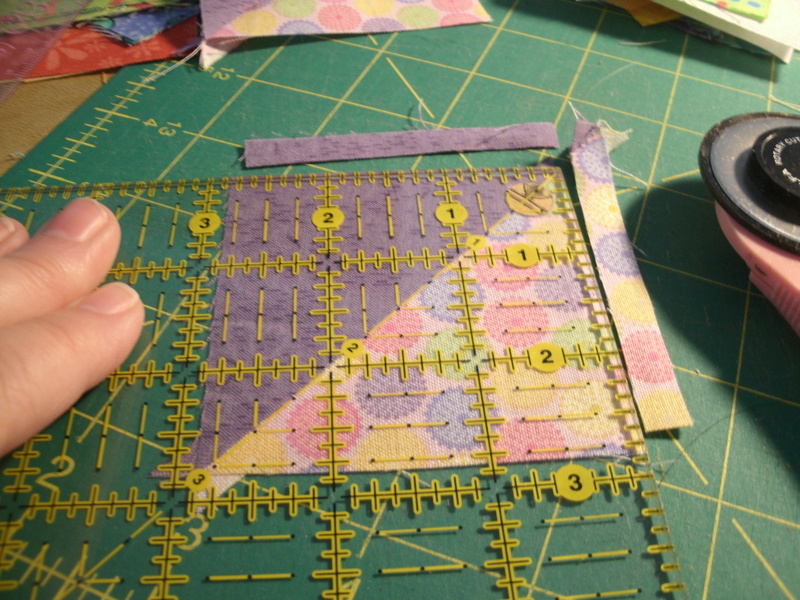 Sew the 4.5″ x 10.5″ dark gray strips to the four Fireworks blocks. Sew to the top of one block, the bottom of another, to the left side of the third, and the right side of the fourth block. Now you can lay the units out in three rows as shown below. Fireworks quilt – Blocks laid out in three rows. Finally, you can sew the three rows together to complete your own Fireworks quilt! My “solution” to the challenge of having one less 6.5″ cat print that I needed was to make a 9-Patch block with a dark gray border. Can you think of another creative solution? Please share in the comment area. If you make your own Fireworks quilt, or a quilt of your own design with the Spinner block, please send me a photo to add to my website gallery and the Thrifty Quilters group on Facebook!